After a few dormant days, politics of confrontation is back again. There are hordes of issues below the oven to fuel the already restive streets that have witnessed numerous strikes called by the opposition parties in the last few weeks. Obaidul Quader believes most of the issues on the table have little to do with the everyday problems of the masses. "We are witnessing an obsession with the past. Past should have an enduring presence in our lives, but obsession has never brought one any good," he says. Quader says the Prime Minister has reasons to believe that the founder of the Bangladesh Nationalist Party Gen Ziaur Rahman was either involved in the carnage of August 15, 1975 or he had tacitly supported the killers of Bangabandhu Sheikh Mujibur Rahman. "Some US government documents are unearthing truths that have been hidden in the dark, and some of them point at Zia's involvement," he says, "Faruk himself had confessed. Besides this, Rashid, Faruk and Bazlul Huda were made MPs in the farcical elections that Khaleda Zia held on February 15, 1996." To make matters worse, he says, the last BNP government cooked up Joj Miah, who had nothing whatsoever to the August 21 massacre, only to save the skins of some BNP stalwarts. He says, "Sheikh Hasina has every reason to believe that the BNP leadership wanted to murder her. Khaleda Zia, on the other hand, thinks the Awami League government has illegally evicted her from her house. She is living in the country without two sons, both of whom are facing corruption trial. My heart goes out to her; she is a mother after all. But you can't disobey the court order. Koko's case has nothing to do with politics. An investigation is done by the FBI (Federal Bureau), and the organisation has unearthed his involvement in the crime. What are we supposed to do here?" He thinks no case filed by the last Caretaker Government against politicians should be withdrawn. "Be it against Sheikh Hasina or Khaleda Zia, Koko, Joy or I–no such cases should be withdrawn. 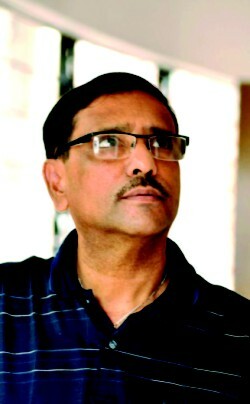 Let the court decide," Quader says, "It is unfortunate, if they (the BNP) think the court is handpicked." The solution he thinks is dialogue, and unconditional it should be. "There is no alternative to dialogue, if we want to come to a consensus on the burning issues of the day. When Manmohan Singh sat with the LET (Lashker-e-Taiba, a Pakistan based militant group) there was no precondition attached to the dialogue. Why won't she (Khaleda Zia) come to dialogue? We live in the age of information super highway, the whole world will know about it if your logical demands are not met," he says. Quader believes election engineering never works. "In the run up to the elections, the intelligence services, Election Commission and other paraphernalia go in the direction popular consent goes," he says, "Our aim shouldn't be to keep or abolish the CTG; it should rather be how to hold free, fair and credible elections." He thinks Sheikh Hasina has got a little weary of the CTG system because of some incidents. "In 2001, even before the council of advisers was formed, the then chief of CTG made 13 secretaries OSD. Even the cycling federation was dissolved. And we know what had happened last time–the BNP-backed President declared himself the chief of the CTG. There were 1.23 lakhs fake voters in the list, which the army later fixed. The last CTG had an agenda of depoliticisation in mind, and when they failed to implement it, they went for elections," he says. He thinks that the CTG failed because it went out for wholesale arrest of the corrupt. "To make matters worse, they had put too many eggs in one basket, as a result, the eggs broke," Quader says, "Because of past bad experiences our leader is viewing the CTG system with an eye of suspicion." He believes to break the present impasse both the parties need to sit together to find a way out. Quader also unofficially looks after Bangladesh Chhatra League (BCL), and he talks of handing out exemplary punishment to the culprits when his attention has been drawn to alleged criminal activities of some BCL-men. "I have talked to the VC (of Rajshahi University) and the DIG of police, and I am going to talk to the Home Minister so that they are arrested and punished. This kind of incident is enough to spoil 10 achievements of the government," he says regarding a photograph published in the day's The Daily Star where some youth allegedly belonging to the BCL are shown brandishing knives and machetes on the Rajshahi University campus. He says that he has also talked to the Vice Chancellor of Chittagong University where some BCL men have allegedly taken control of carriages of university shuttle trains, making life difficult for non-BCL students. "Students like them aren't going to be given any place in the new committee of the BCL. It has been quite a few years that the BCL has not witnessed a council. Rectifying measures must be taken too," he says. Quader believes that it is high time that student union elections are held regularly at different educational institutions. "It will make student leaders accountable to people," he says. Quader thinks Maradona himself is not enough to win the world cup: "The PM is our symbol of unity; besides her no-one else should hold posts both in the government and in the party," he says, adding that it harms both the government and the party. He thinks the government has a strong team leader, but there is no teamwork. "A lack of coordination is evident and there are responsible persons (in the government and the party) who are making the most irresponsible of comments," he says. He thinks a cloak of suspicion and war of words have engulfed politics in our country. "The wall of suspicion has become taller and wider, whereas we need to bridge gaps," he says. Quader believes the government's performance so far has been unsatisfactory. But he thinks things will be a lot better when the mid-term agendas are materialised. "Prices of essentials need to be curbed; problems centring on electricity and gas need to be resolved; and law and order have to be maintained, otherwise these things will make an impact on the results of the next elections," he says. He thinks mutual respect between politicians has been sent into exile. "It is sad that value-based politics has become elusive. We only see sycophantic eulogy and rancorous debate in the parliament. Most of the MPs are after making money. Very few of them study or do their homework. It seems, we are strangulating ourselves," Quader says. He says the government needs to find out how much impact the stock market debacle and Limon issue has made on the minds of the masses. "Some people are trying to keep the PM in the dark," he says. He believes the country is in grave danger. "Dhaka has been judged by a British magazine as the second dirtiest city in the world after Harare. Of our 18000 kilometres waterways, only 6,000 is left. We need 25 percent forest in the country, and in reality we have at hand only 10 percent," he says, "Can't we sit together to save ourselves, to protect our common glory?"